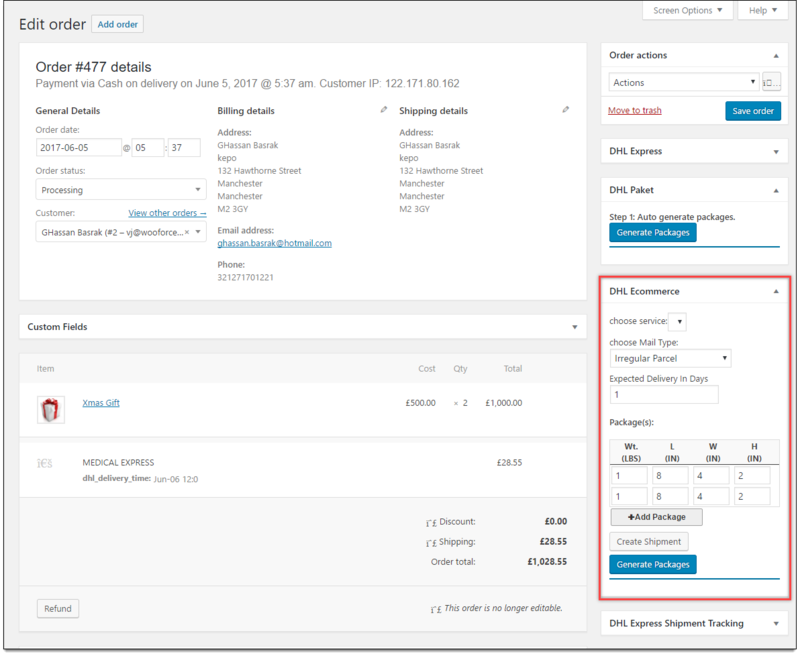 Home / How to set up WooCommerce DHL eCommerce in ELEX WooCommerce DHL Express/eCommerce/Paket Shipping Plugin with Print Label? How to set up WooCommerce DHL eCommerce in ELEX WooCommerce DHL Express/eCommerce/Paket Shipping Plugin with Print Label? This tutorial explains how to set up DHL eCommerce shipping option using ELEX WooCommerce DHL Express/Paket Shipping Plugin with Print Label. Please refer to the product page to know more about the plugin features. 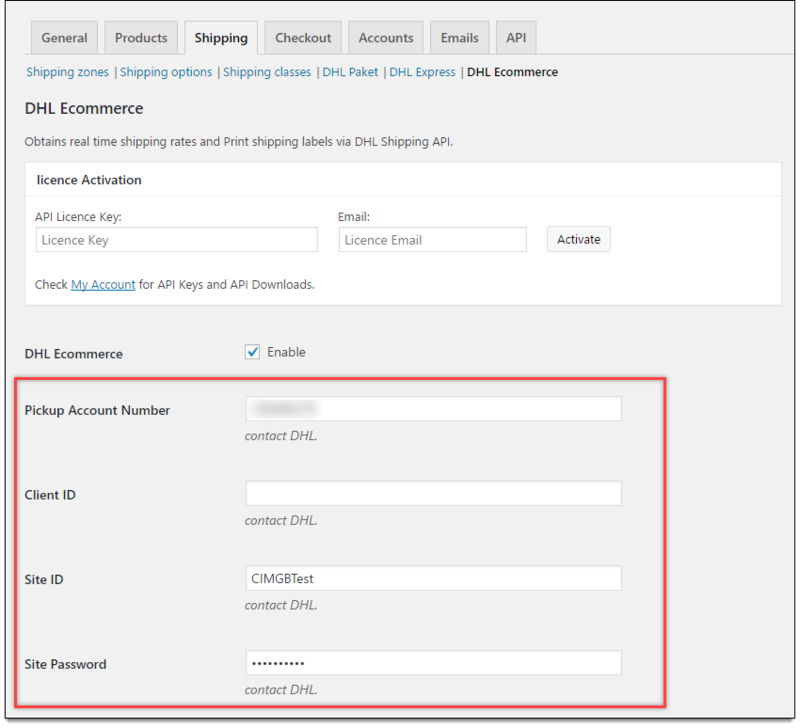 For WooCommerce DHL Express, read how to set up WooCommerce DHL Express?. DHL eCommerce focuses on providing services for domestic and international parcel pickup, delivery and return solutions for business customers as well as eCommerce logistics. It also helps in shipment tracking and facilitation services. Our ELEX WooCommerce DHL Express/Paket Shipping Plugin with Print Label allows you to print shipment label, set handling charges and helps in tracking the shipment. You can also set a custom shipment message and generate bulk labels for your WooCommerce orders. Read an article to know how to complete the checkout process on ELEX. You can also read how to download, install, activate ELEX plugins. To get started with DHL eCommerce, navigate to Dashboard > WooCommerce > Settings > Shipping > DHL eCommerce. To start using DHL eCommerce service, enable the respective checkbox – DHL eCommerce. If this option is disabled, you won’t be able to use any of DHL eCommerce services. Pickup Account Number: This account number is the Customer ID (or DHL eCommerce account number) provided to you once you sign up for a DHL account. Client ID: This ID is the identifier for accessing the web services. Site ID: This ID is your DHL eCommerce account username. Site Password: This ID is your DHL eCommerce account password. You can contact DHL eCommerce for the above API credentials. Facility code defines the DHL eCommerce facility location that receives and processes the shipment. It is assigned based on your shipping location. Our plugin converts product dimensions and weight to the selected unit, and then the selected dimension and weight unit are passed to the API. Pounds & Inches: Product dimensions and weight gets converted to pounds and inches before sending it to the API. Kilograms & Centimeters: Product dimensions and weight gets converted to kilograms and centimeters before sending it to the API. Service Code: It defines the unique code for each service. Name: All service names are displayed as placeholder text. You can also set custom text for services that you use. 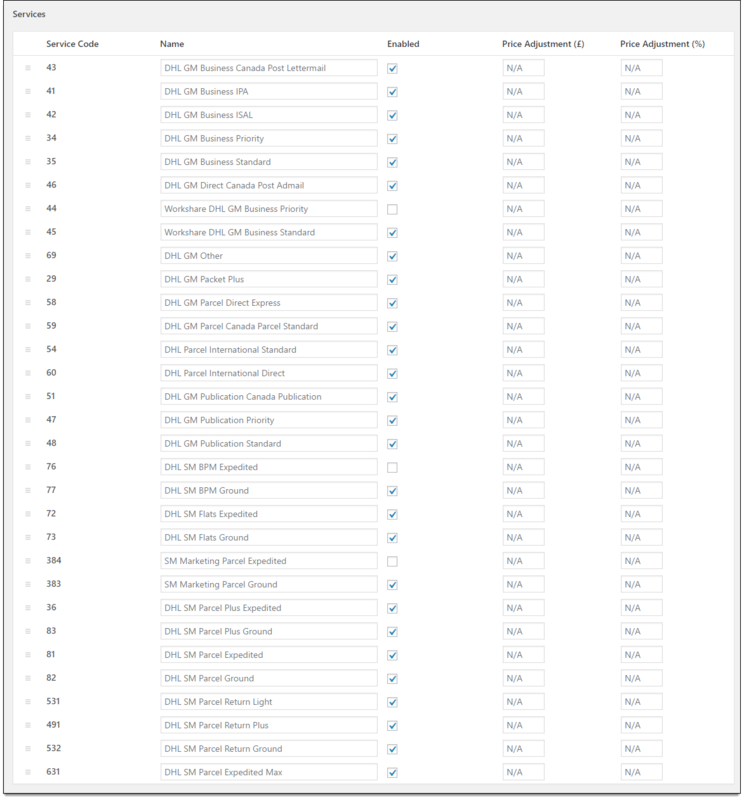 Enable: Under this column, you can enable or disable your desired services with the help of a checkbox option next to each service. Price Adjustment (£): Allows you to adjust shipping price in terms of cost for the desired service. Price Adjustment (%): Allows you to adjust shipping price in terms of percentage for the desired service. 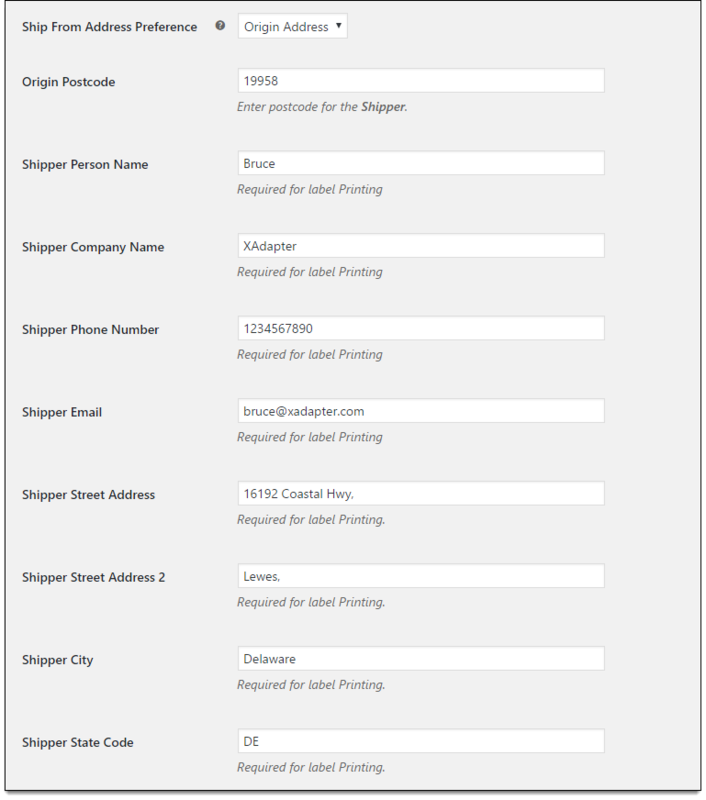 Ship From Address Preference: With this field, you can set an address of the actual order shipper. This option is useful when using a multi-vendor plugin along with this plugin. Origin Postcode: This is the postcode of the place from where you are shipping items. Shipper Name: Enter name of the shipper. Shipper Company Name: Enter your company name. Shipper Phone: Enter your contact number. Sender Email: Enter the email address of the shipper, so that you can receive emails from DHL while creating the label. Shipper Street Address: Enter the first line of Address. Shipper Street Address 2: Enter the second line of Address. Shipper City: Enter your city name. Shipper State: Enter your state name. Shipper State Code: Enter the respective state code. Note: It is mandatory to enter all the above fields. Label print size: With this field, you can set the size of the printing label. 8X4_A4_PDF: Generates labels in PDF format with a size of 8 x 4 inches. 8X4_thermal: Generates labels with a size of 8 x 4 inches. This is suitable for ZPL2 and EPL2 format. 8X4_A4_TC_PDF: This option generates labels in TCPDF format with a size of 8 x 4 inches. 8X4_CI_PDF: Generates labels in PDF format with a size of 8 x 4 inches for CI printers(compact printer). 8X4_CI_thermal: Labels will be in PDF format with a size of 8 x 4 inches for CI thermal printers(compact printer). 6X4_A4_PDF: This option generates labels in PDF format with a size of 6 x 4 inches. Print Label Type: With this field, you can set the required file format for printing the labels. PDF: This option prints the label in portable document format, which is used to present documents in an independent manner of application, software, hardware, and operating systems. ZPL2: This option is suitable for printing on Zebra branded printers. EPL2: This option is suitable for printing on media of reduced space, and although it supports bitmaps (and therefore, arbitrary images), its use is usually for labels including bar-code information. 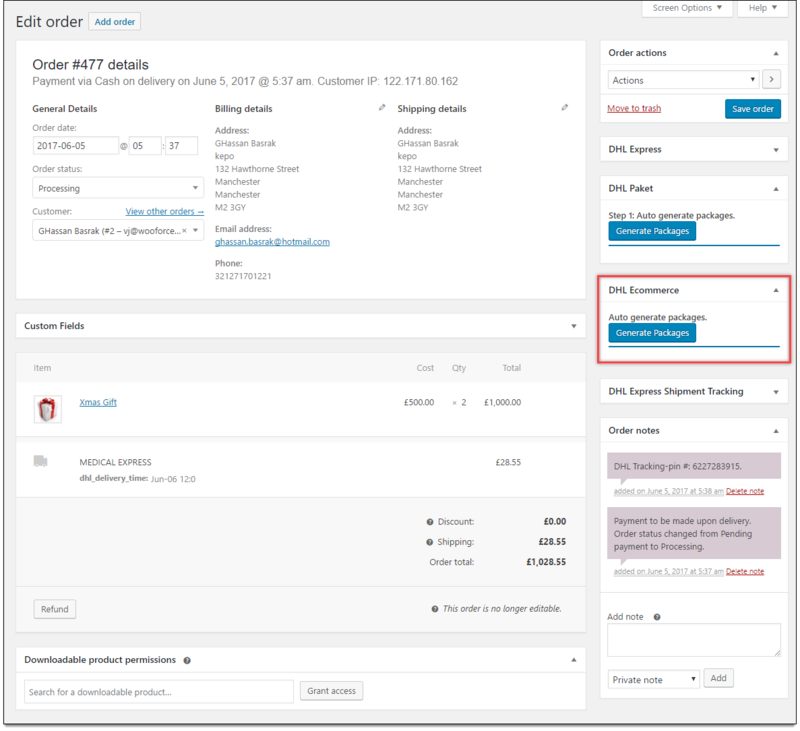 Enable the Tracking PIN option to add tracking pin information to customer order notes. You can customize the shipment message that customer can see in order completion email. While customizing the message, you can include placeholders for shipment ID, shipment service and shipment date. Note: If you leave this field empty, the displayed default message in the placeholder will be sent to the customer in the order completion email. If you are not getting proper rates (lesser or higher than expected), not getting all the available shipping options, or not getting rates at all, then you can enable the Debug option to find the error(s). Contents description: Enter a description for the contents of the shipment. Default service for domestic: Select a default DHL domestic service from the drop-down list. Default service for international: Select a default DHL international service from the drop-down list. Navigate to Dashboard > WooCommerce > Orders. To generate a package, choose your desired DHL eCommerce service and Mail Type. You can also set the expected number of delivery days. By default, some packages are generated automatically. You can change the weights of the package as you like, or add additional package by clicking +Add Package button. Finally, click Create Shipment to proceed further. 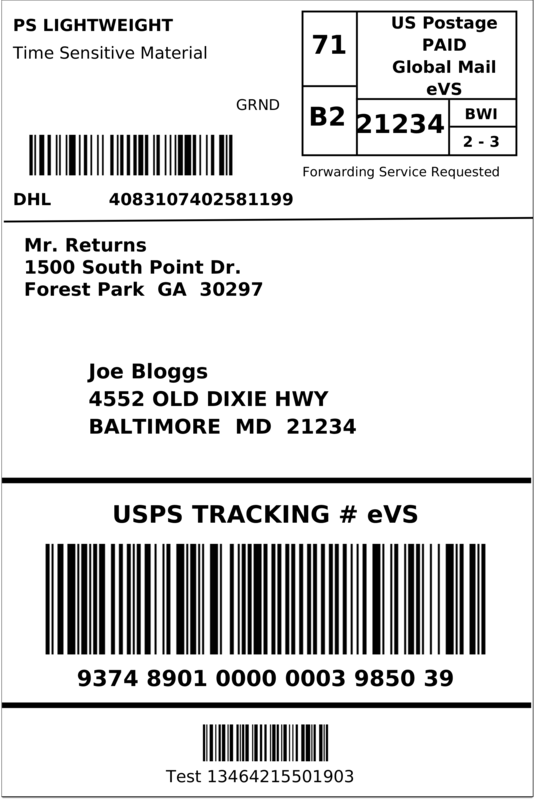 Once the shipment is created, you can click the Print Label option to print a shipping label. To explore more details about the plugin, go check out ELEX WooCommerce DHL Express / eCommerce / Paket Shipping Plugin with Print Label.